Matt dropped off work for Saturday's Earth Day art show, then we went to the alley to smoke in the sunshine rainstorm (yep, Seattle). We ambled over to the local free lending library; most of the books were gone. That's not unusual--I suspect hard-up people clean out these shareboxes to sell the donations to used bookstores. One of the few left looked like a vanity pressing of a cheesy self-help guru and I chortled smugly as I picked it up in the hopes of heaping more derision on it. Well, you know what they say about books and covers re: judgment? Looking it over, what jumped out at me were the names on the blurbs: Jimmy Carter, Rosa Parks, Coretta Scott King, and Kurt Vonnegut. 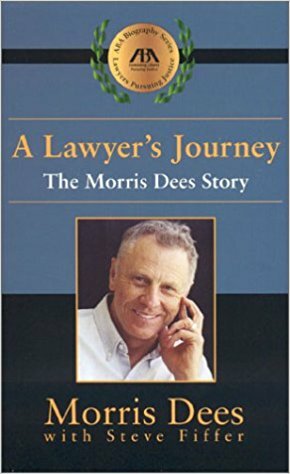 Whoa, who was this... Morris Dees? I found out as I burned through this memoir of one of the preeminent civil rights attorneys of our times. Born in hardscrabble but genteel circumstances to a white tenant farmer family in Alabama, his father was exceptional in that he resisted the ingrained bigotry that was typical of mid-20th century Montgomery and passed--sometimes whupped--that tolerance into Morris from an early age. After a string of entrepreneurial successes before he even finished college, Dees devoted his life to public advocacy and went on to found the Southern Poverty Law Center. A Lawyer's Journey is a pageturner replete with armed standoffs, political intrigue, and courtroom drama. But above all it's a reminder that social justice progress is not inevitable but results from dedicated people taking decisive action--and uncomfortable risks--to manifest their ideals. If I'd read this a couple of years ago I would've thought the struggle against militant white supremacy was safely in the past, but now this 2001 book seems more timely and ominous than ever. Institutionalized racism suffered many setbacks from Dees' innovative lawsuits against the KKK, white militia movements, and government itself, but it's looking like those were battle victories in a longer war that hasn't been decided yet. The GOP is fundamentally racist--voter suppression of minorities is the only way they can win elections. Now in control of Congress, the White House, and ultimately the judiciary, the table is set for a funeral feast of what's left of our civil rights. A Lawyer's Journey is more relevant than ever.